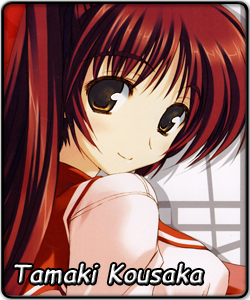 Tamaki is a childhood friend of both Konomi and Takaki, the main character. The two often see her as an older sister, since she is a year older than Takaki and she looks more "grown up" in many ways. She left her two friends when they were young to enter an all-girl boarding school, promising to return in her final year of high school. Her brother is Yuji, who she deals with very forcefully due to his habitual perverted actions. Her signature forehead vicegrips to Yuji contrasts her other kind and dependable personality. Coming from a rich and prestigious family, Tamaki often expresses proficiency in Japanese arts and traditions, yet she acts just like a normal girl around her friends, even if sometimes too strict. In fact, she is often very "physical" towards Takaki (and even Konomi...), leaving Yuji confused on what his reaction should be. She shows romantic interest in Takaki and is very outward about it: declaring it to everyone and taking the first strike. What will Takaki's decision be?